We are not given the exact time when this event occurred, but the context from John’s account shows that it must have been at the close of Jesus’ public teaching in the temple — probably Tuesday afternoon. Jesus had been teaching in the Temple on Monday and Tuesday, amidst challenges by the Pharisees and the Sadducees, when the disciples were approached by some Greeks. The term “Greek” can directly refer to a native of Greece or it can also broadly refer to a foreigner. Either way, these Greeks were God-fearing Gentiles who had come to the Passover to worship with the Jews. The events of that week had interested them enough that they sought out an audience with Jesus. There is a lot of conjecture regarding why the Greeks approached Philip. Philip was one of the two disciples with a Greek name (also Andrew) and it is of interest that John specifically mentions here that Philip was from Bethsaida. There may have been a local or a cultural connection that brought them to Philip, or Philip may have simply been on duty nearest to where the Greeks approached. Philip told Andrew and together they brought the news to Jesus. The remaining part of John 12 is Jesus’ final public remarks. After these statements on Tuesday, he will leave the crowd and not appear again publicly until he is being arrested on Friday morning (John 12:36). The first statements by Jesus are about his approaching death. Jesus had announced several times before that “my time has not yet come” (John 2:4; John 7:30; John 8:20). But now his time has come. The time has come for Jesus the Messiah to die, to give his life as a sacrifice for the world. By the context, these statements seem to be prompted by the Greeks wanting to see Jesus. What was significant about the arrival of the Greeks? Jesus used their presence to draw out a higher principle. Whatever they were going to ask Him (which was never recorded), Jesus tells them what is going to happen and what it will take to be His disciple. The fact that they are Gentiles is no longer an issue, as he will draw all men to himself (John 12:32). 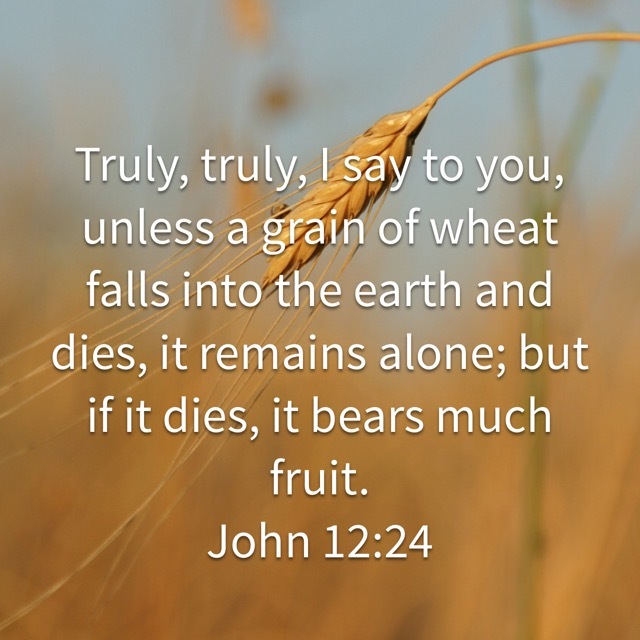 Jesus used the paradox of a seed as an illustration. By itself, the seed is alone and unfruitful. It is not until it dies (is planted) that it is fruitful. This has two implications. First, He must die in order to cast out the ruler of this world and draw all men to himself (John 12:31-33). There cannot be the Kingdom of God unless He dies. Secondly, his disciples must also give up their lives, “whoever hates his life in this world will keep it for eternal life”. We put aside our physical lives in order to gain eternal life. This is not a command for self-hatred, but rather that we should consider our own lives as worthless in comparison to the glory of eternal life, the fellowship with Jesus Christ, and the honor from God the Father. “Now is my soul troubled. And what shall I say? ‘Father, save me from this hour’? But for this purpose I have come to this hour. Father, glorify your name.” Then a voice came from heaven: “I have glorified it, and I will glorify it again.” The crowd that stood there and heard it said that it had thundered. Others said, “An angel has spoken to him.” Jesus answered, “This voice has come for your sake, not mine. “Now is my soul troubled.” The English translation is not strong enough. Jesus was horrified as he anticipated the cross. The word for “troubled” here signifies horror, anxiety, and agitation . This is the same word used for Jesus as he stood at the grave of his friend Lazarus (John 11:33). It was the same word to describe the terrified disciples when they saw Jesus walk on the water (Mark 6:49-50). Jesus was terrified at the thought of his crucifixion. It was not the extreme torture and physical suffering that brought such horror, but the separation from God that the cross would require. Jesus would take on the punishment for the sins of the world. But Jesus took comfort in what is most important. It was for God’s glory that he waited for his friend Lazarus to die before coming to heal him. This is the same thing that now that compels Him to go all the way to the cross, enduring the separation and the agony of his sacrifice. God’s glory was most important! For the third time in Jesus’ life on earth, God the Father speaks directly from Heaven (see Matthew 3:16-17 and Matthew 17:1-6 for the other two occasions). God’s name has been glorified and it will be glorified. God will be glorified through Jesus’ death on the cross. By going to the cross, Jesus would pronounce judgement on this world and cast out its ruler. Satan has been ruling the world since Adam’s rebellion (Genesis 3), but his power has been broken by the cross. The judgement has not been executed yet, but the world now sits under the sentence. He will draw all people to himself. The world will be judged and all people will be compelled to bow to Jesus Christ (Philippians 2:9-11; Romans 14:11). All will bow but not all people will be saved. Jesus immediately continued with the warning to believe in him while they still have a chance (John 12:35-36). As discussed in the post here, Jesus warns the people that “Unless you believe that I AM you will die in your sins” (John 8:21-24). This is the also the third time that Jesus said that he would be “lifted up” (see also John 3:14-15; John 8:28-29). The earlier references were a foreshadowing of the cross, but this statement was very clear. The people of his day readily understood the term “lifted up” as being placed on a cross. Jesus would die by crucifixion . But the people also knew that the Messiah would rule over an everlasting kingdom (Daniel 7:13-14). Therefore, how could he be the Messiah if he was about to die? This is Jesus’ final appeal to unbelievers. He will be among them for only a short time and then he will be gone. There is little time remaining to believe in the one who is the light. This passage teaches a much more sobering principle. God urges people to believe, but their time is limited. For those who keep refusing to believe, the time will come when they are no longer able to believe. You have limited chances to believe! This message is confirmed by two references from Isaiah. The first reference (Isaiah 53:1) tells about the coming Messiah. He will suffer and be rejected, and they refuse to believe Him. The second reference (Isaiah 6:9-10) shows that God punished their unbelief by allowing the people to have their delusion. They had spent too bunch time refusing to believe and now they could not believe. This was Jesus’ last public appeal. After he said these things, he left and they could no longer find him. The glory that Isaiah saw (Isaiah 6) was Jesus Christ himself. Even some of the ruling Jews believed in him. We know of two of them — Nicodemus and Joseph (John 19:38-39). Although they believed, they were too afraid of the Pharisees to publicly declare their belief. Jesus had already left the crowd (John 12:36). Most commentators believe that these final statements at the end of the chapter are collected by John as a summary. The first 12 chapters of John’s gospel account give the presentation of Jesus Christ to the world. The rest of the book (starting at chapter 13) give the presentation of Him to his own disciples. You cannot separate the Son from the Father. If you believe in Jesus then you are believing in the Father. When you see Jesus you see the Father. Jesus came into the world with a message of mercy to save the world. But for those who do not believe him, these same words of Christ will be their condemnation at the last day. Those who refuse his message of mercy will get his message of judgement (John 3:18). Crucifixion demonstrated that the claims against him were totally false. The Roman crucifixion was used for seditionists, yet Jesus was cleared of all charges of sedition (John 19:6-7). He went to the cross because he claimed to be the Son of God. Crucifixion was public and visible for everyone to see. Jesus was clearly visible to everyone while on the cross. Stoning was quick and could have been done privately. Jesus was able to publicly speak while on the cross. Crucifixion validated Jesus’ death with absolute certainty. The Romans verified that the victim was absolutely dead. Therefore, there was no question that Jesus was dead when He rose on the third day.